[AUTO](RC) Generation Break 1:[Counter Blast (1) & Choose one of your other rear-guards, and retire it] When this unit attacks a vanguard, if this unit is boosted, you may pay the cost. If you do, choose up to one of your opponent's rear-guards, retire it, until end of turn, this unit gets [Power]+5000, and "[AUTO](RC):When this unit's attack hits a vanguard, draw a card.". Tachikaze's equivalent to Wink-killer. This card, when GB1's active and he's attacking the vanguard while boosted, eats a rearguard and Counterblasts 1 to retire an opposing rear-guard. Then Jigsaw gains 5k, and if the attack hits, you draw a card. Uh, okay. So combined with Gaia Emperor, we're looking at a minimum of +1 and a +2 on a good day for CB1, and it addresses problematic rear-guards. I like this, quite a bit I should add. Unfortunate that the number of decks where he'd fit is a bit limited but that's hardly a good reason not to run it in the places where he belongs. The one with the most potential to be the greatest clone card. Oh look, it's the Tachi GBCBX unit. 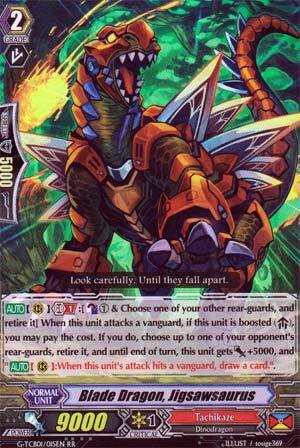 This one noms another rear guard, gets +5000 power and draws cards if it hits. Yes, you should be running this, why are you even asking that? Draw power is good.